As the name connotes ('Him' means snow), it is a land of snow-clad mountains, snow-fed rivers and sparkling streams, the beauty of which has lured many to this enchanting place. 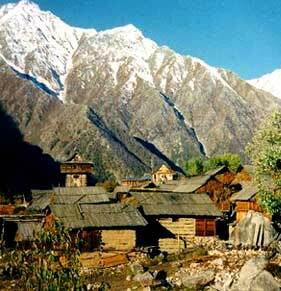 Himachal Pradesh is a hallowed land, a land of gods, goddesses and saints. Religion is the bed-rock on which the culture, arts and crafts of this state are founded. 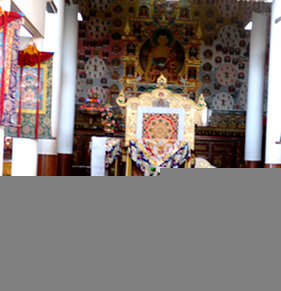 This is more than evident in the numerous Hindu and Buddhist shrines and monasteries, where the people of Himachal have surpassed in stone and woodcarvings. Nestled in the Himalayas, the world's mightiest mountain ranges, Himachal is blessed with some of the most spectacular landscapes anywhere. Truly a travellers paradise, with mighty snow peaks, deep gorges, lush green and golden valleys, flower filled meadows, misty woods, fast flowing icy rivers, glaciers and enchanting lakes. While the picturesque valleys of Kullu, Kinnaur and Kangra are a riot of colours, in marked contrast the barren terrain of Lahaul & Spiti have a stunning lunar landscape like beauty. Many of these include: from Shimla - Mashobra, Kufri, Naldehra; those around Kullu-Manali include Manikaran, Naggar and Brighu Lake; the barely accessible valleys of Lahaul and Spiti are a trekker's delight. For the visitor there are superb locations for relaxing and sight seeing. There are also tremendous opportunities for trekking, mountaineering, fishing, river rafting, skiing, para-gliding, ice skating and golf. 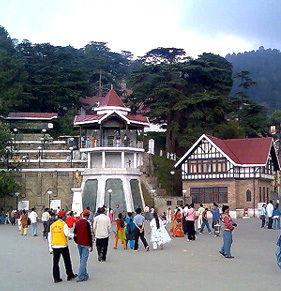 Himachal Pradesh tourism has been divided into four interesting travel circuits. The Sutlej Voyage circuit passes through the shiwalik foot hills through apple orchards, forests of pine, oak and deodar, majestic monuments of the Raj, snow covered ski slopes and the furious Sutlej river. This circuit covers Delhi - Rohru - Rampur - Sarahan - Narkanda - Naldehra - Tattapani - Shimla - Kiarighat - Delhi. This voyage also includes Renuka, Paonta Sahib and Nahan. 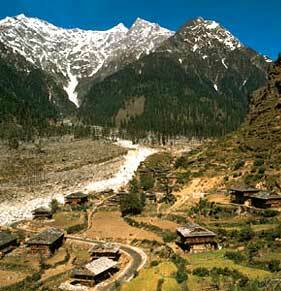 The Beas Voyage covers the highly picturesque Beas valley - the valley of gods. 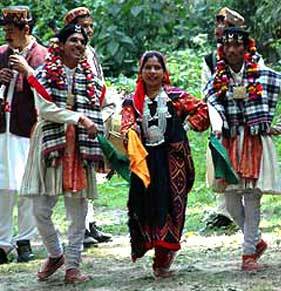 Flower covered meadows, terraced fields of apple, paddy, maize and the sparkling Beas river. 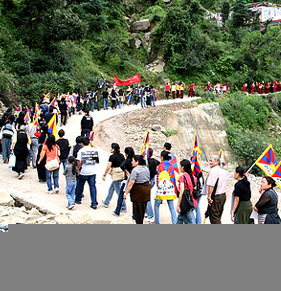 It covers Delhi - Shimla - Mandi - Rewalsar - KulluManali - Rohtang - Nagar Manikaran - Delhi. 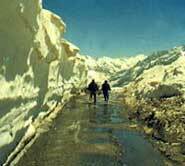 One can also continue to Leh across the Baralacha pass. The Dhauladhar Voyage circuit passes in the shadow of the mighty and majestic snow clad Dhauladhar ranges, which dominate the beautiful Kangra valley, dotted by flower filled meadows, temples, tea gardens and flocks of sheep. It covers: Delhi - Chintpurni - Jwalamukhi - Kangra - Dalhousie - Khajjiar - Chamba - Dharamsala - Chamunda - Palampur - Jogindernagar - Delhi. The Tribal Voyage Circuit passes through a spectacular terrain of river valleys, cold desert mountains, high passes, snow capped peaks, icy lakes, mighty glaciers-an exotic tribal country dotted by monasteries. 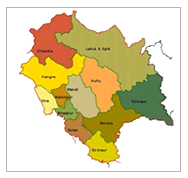 It covers: Delhi - Shimla - Narkanda/Hatkoti - Sarahan - Sangla - Kalpa - Pooh - Nako - Tabo - Dhankar - Kaza - Losar - Kunzam - Koksar - Sissu - Keylong - Udaipur - Trilokpur - Rohtang - Manali - Delhi. Winter Carnival Manali, (Feb.) Mandi, Shivratri (March), Ladarcha fair, Spiti, (July) Minjar fair, Chamba, Manimahesh fair, Bharmour and Tribal Festival, Keylong (August) Phulech (festival of flowers), Kinnaur (Sept.) Kullu Dushera (October), Lavi fair, Rampur (Nov.), Renuka fair, (Nov.) Ice Skating Carnival, (Dec.). The Himachal State Museum displays sculpture, paintings, decorative arts, jewellery, wood carvings, manuscripts, arms and armoury. Also on view are Stone Age tools and implements. prehistoric pottery and terracotta. 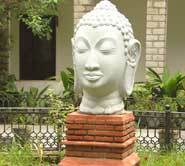 The Bhuri Singh Museum is a unique art museum. Established in 1908 the museum moved to its present premises in 1983. 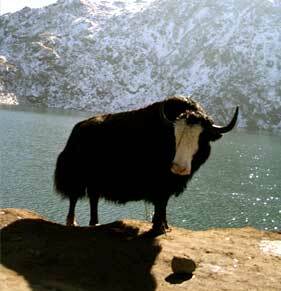 It derives its name from the enlightened Bhuri Singh who ruled the state between 1904 and 1919. On view are a fine collection of wall paintings, miniature paintings from the Pahari school and the Rang Mahal series. 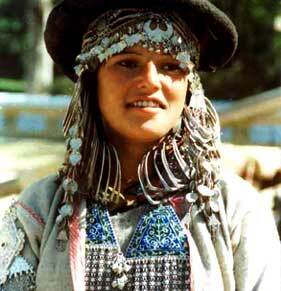 There are also Chamba rumals, embroidered textiles which are exclusive to the region. Other antiquities include bronzes, copper plates and wood carvings, all of which represent the artistic traditions of the state. Nearest Railway Station (Broad gauge) Chandigarh, Kalka, Pathankot and Nangal. (Narrow gauge) Shimla, Jogindernagar. 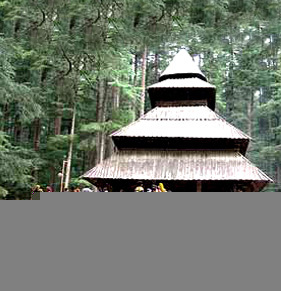 Jubbarhatti (Shimla), Bhuntar (Kullu) and Gaggal (Dharamsala).